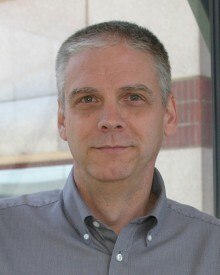 Home People Primary Faculty Jeffrey Harrison, Ph.D.
Office: R5-254 Academic Research Bldg. Our laboratory is interested in understanding the functional significance of chemokine networks in the central nervous system with a primary focus on determining roles for these molecules in malignant brain cancers such as glioblastoma. We study mechanisms involved in tumor-immune cell interactions as well as direct effects of chemokines on glioma initiating cells. Experimental approaches encompass in vitro and in vivo methods and include the use of chemokine receptor selective pharmacological agents. Pham, K., D. Luo, D.W. Siemann, B.K. Law, B.A. Reynolds, P. Hothi, G. Foltz, and J.K. Harrison. VEGFR inhibitors upregulate CXCR4 in VEGF receptor-expressing glioblastoma in a TGFβR signaling-dependent manner. Cancer Letters. 360:60-67, 2015. Würth, R., A. Bajetto, J.K. Harrison, F. Barbieri, and F T. Florio. CXCL12 modulation of CXCR4 and CXCR7 activity in human glioblastoma stem-like cells and regulation of the tumor microenvironment. Front. Cell. Neurosci. 8:144, 2014. Liu, C., K. Pham, D. Luo, B.A. Reynolds, P. Hothi, G. Foltz, and J.K. Harrison. Expression and functional heterogeneity of chemokine receptors CXCR4 and CXCR7 in primary patient-derived glioblastoma cells. PLoS One 8:e59750, 2013. Pham, K., D. Luo, C. Liu, and J.K. Harrison. CCL5, CCR1, and CCR5 in murine glioblastoma: immune cell infiltration and survival rates are not dependent on individual expression of either CCR1 or CCR5. J. Neuroimmunol. 246:10-17, 2012. Liu, C., D. Luo, B.A. Reynolds, G. Meher, A. Katritzky, B. Lu, C. Gerard, C. Bhadha, and J.K. Harrison. Chemokine receptor CXCR3 promotes growth of glioma. Carcinogenesis 32:129-137, 2011. Liu, C, D. Luo, W.J. Streit, and J.K. Harrison. CX3CL1 and CX3CR1 in the GL261 murine model of glioma: CX3CR1 deficiency does not impact tumor growth or infiltration of microglia and lymphocytes. J. Neuroimmunol. 198:98-105, 2008.